This is the first issue of the PETER MAX magazine. 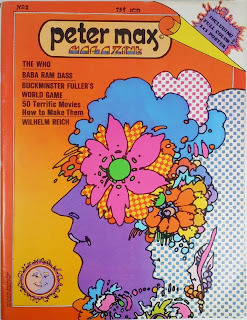 It had a lot of intersting stuff for that time mainly esoteric text, unique Peter's graphic expressions and it reflects a Psychedelic influence of the Sixties. 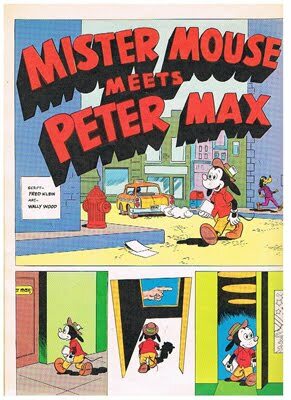 Very uncommon, a comic strip with Mickey Mouse and a travesti Bugs Bunny with mustache and long black hair (Peter) that leads Mickey through a wild journey through space and time. 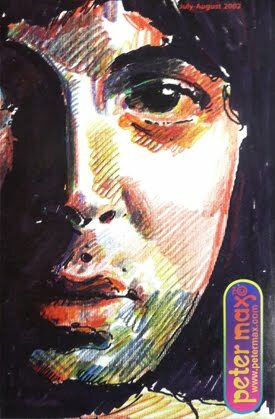 Also, there's even a thermograph (heat design) of Max's face and even an X-ray of his Skull... so very weird. 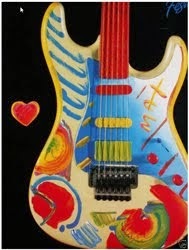 The back page, is a very funny LOVE cereal that probably ws sponsored by the Max studio. Ah, cannot forget a Vegan culinary recipt as well. 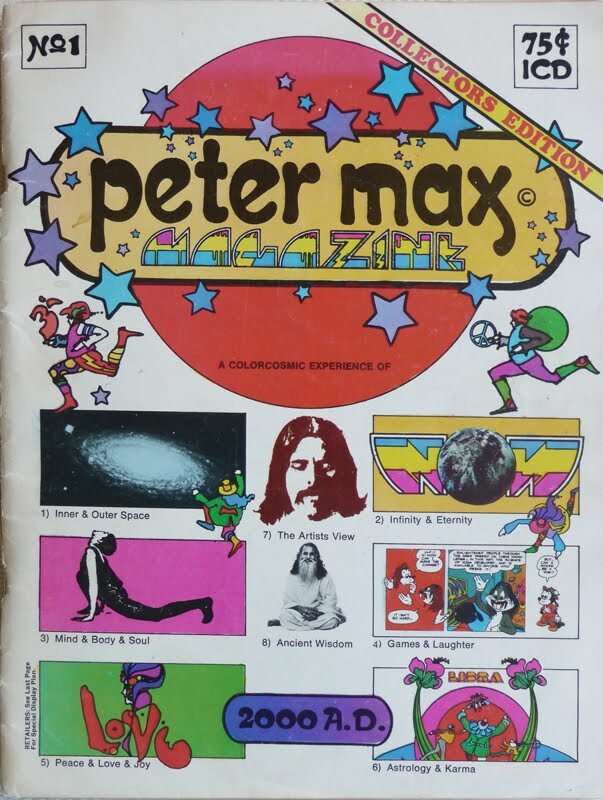 This was the first issue of the Peter Max Magazine. 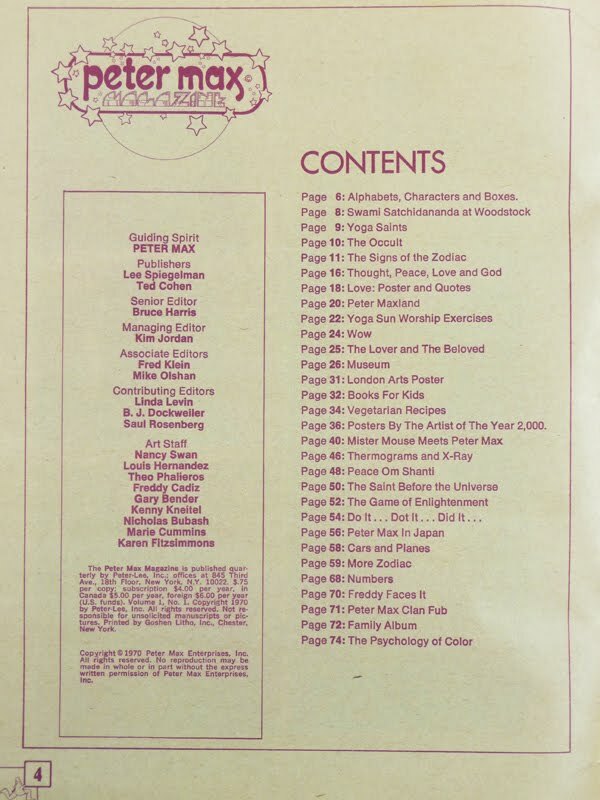 Subjects covered include Inner and Outer Space, Infinity and Eternity, Mind and Body and soul, Games and Laughter, Peace and Love and Joy, Astrology and Karma, The Artists View, and Ancient Wisdom. There is an article on the artist's life, and a comic strip with characters similar to Mickey Mouse, Bugs Bunny, Olive Oyl, and others. 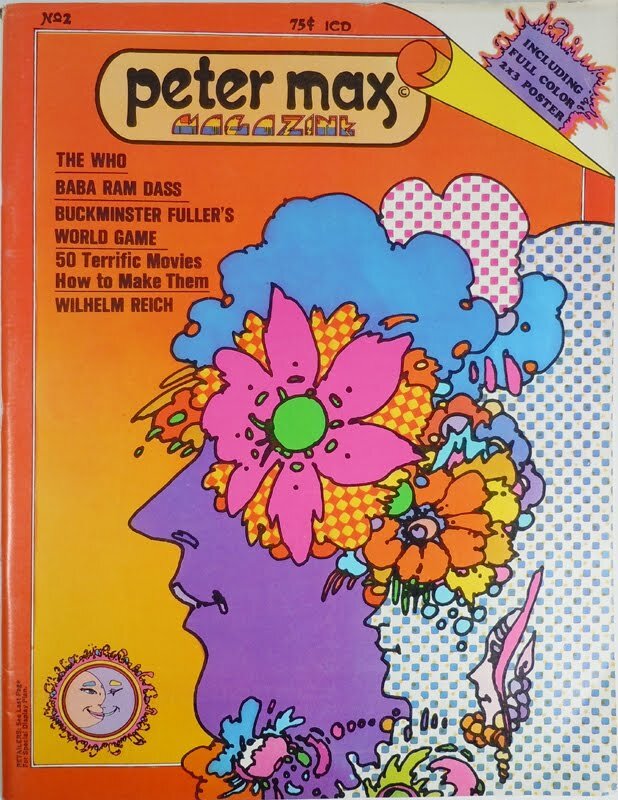 The ad on the back advertises Swiss Mixed Cereal with a Peter Max design on the box. 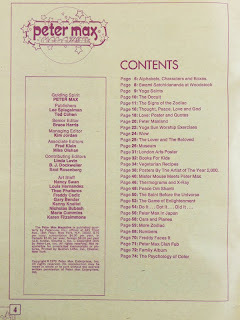 One section is on the Zodiac, another on exercise, and one has recipes for things like Kasha Croquettes, Cous-cous, and Oopma. 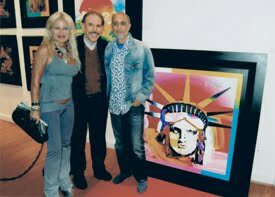 There are pictures, red on tan, of the Peter Max exhibit at the M. H De Young Museum in San Francisco.